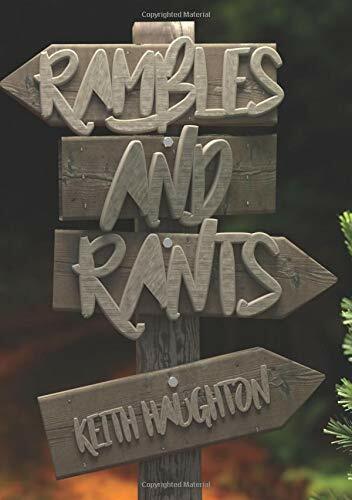 My name is Keith Haughton, and I would love for you to check out my new memoir, Rambles and Rants, available at Amazon in both digital and paperback formats. From the book description on Amazon: "Part memoir, part engaging dialogue, Rambles and Rants is unlike any book you have ever read. Intensely personal, yet immediately relevant, it is the story of one man’s struggle to survive in a world that feels increasingly unstable, disorienting and dangerous. It is, above all else, an inspirational journey of hope and healing, even in the midst of fear, confusion, and suffering." Here is a brief excerpt from my book: “Today’s sorrows, yesterday’s regrets…these things do not determine the content of our tomorrows. Whatever we are struggling with, whatever pain we suffer, whatever hopelessness we hunger to escape, it is a lie from the depths of hell to believe that it will always be this way. There is hope, my friends. I wouldn’t write these words if I did not believe them with all of my heart: I promise you, there is hope.